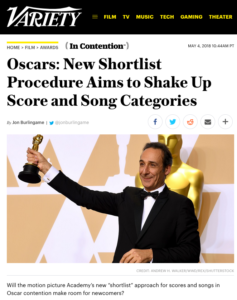 The Academy never stops tinkering with the music rules. The latest addition is actually a throwback to an earlier era: There will now be an Oscar “shortlist” for best song and best score of the year, a 15-film list for each category from which the final five nominees will be chosen. It’s a process the Academy music-branch used to follow, back in the ’60s and ’70s, but long ago abandoned. Academy governors refused to discuss the reinstatement of the concept, but I obtained an in-house document and talked to Academy insiders about what it means and how it will be accomplished for this Variety story. This entry was posted in Composers, Film Music and tagged Academy of Motion Picture Arts & Sciences, music Oscars, Oscar music, Oscar music branch, Oscar music shortlist, Variety on May 4, 2018 by Jon Burlingame.